Allergic diseases, more commonly known as allergies include a range of conditions aggravated by hypersensitivity of the immune system to an agent in the environment. Allergic diseases include allergic rhinitis (hay fever), food allergies, asthma, asthma, anaphylaxis and atopic dermatitis. 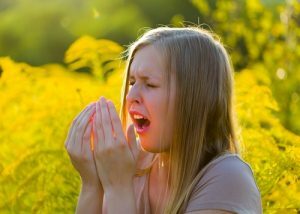 Hayfever is most common allergic disease with between 10-30% of populations in western countries suffering from it per year and the number of cases has risen significantly in the past few decades. 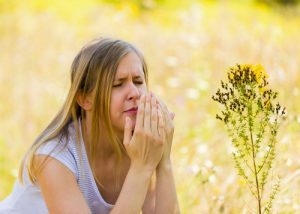 With the summer months not far away the risk of allergies will begin to rise so now the is the ideal time for us to investigate the anti-allergenic properties of quercetin. Today we are going to take a look at quercetin and its uses for the treatment of allergies. The polyphenols are widely considered to be effective anti-allergenic compounds able to regulate immune cells and the allergic immune response. Some of the most investigated plant polyphenols are resveratrol, genistein and of course quercetin, these compounds have exhibited a strong influence on immune functions in research studies (1). Studies show that polyphenols can modulate allergic sensitization and also influence allergic effector cells to inhibit the allergic response thus reducing the severity of symptoms (2). As part of their anti-allergenic action, polyphenols prevent the release of histamine in human basophils (3) and also in mouse mast cells (4). Histamine is a nitrogenous compound that is involved in localized immune responses, it also regulates gut function and acts as a neurotransmitter. Histamine has a key role in the inflammatory response and is produced by basophils and mast cells found in the connective tissues. As part of its normal function histamine increases the permeability of the capillaries allowing white blood cells easier access to engage pathogens in infected tissues. The problem is when the body produces too much histamine and the immune response and inflammation becomes excessive as happens during an allergic reaction. Polyphenols inhibit the release of histamines and thus prevent or at least reduce the allergic reaction. As well as their effect on histamine release, flavonoids and in particular quercetin have attracted the attention of researched for their immunomodulatory and anti-inflammatory properties. Quercetin has been shown to be able to stimulate the immune system, inhibit histamine release, reduce the pro-inflammatory NF-kB protein complex, reduce pro-inflammatory signalling as well as having antiviral activity (5-6). Quercetin has been shown to induce gene expression and production of Th-1-derived interferon-g (IFN-g) and also downregulates Th-2 derived interleukin-4 (IL-4) in peripheral blood mononuclear cells (7). The cytokine IFN-g plays an important role in immune response against pathogens and tumor control, however, excessive levels of IFN-g are associated with a number of inflammatory and autoimmune diseases. IL-4 is a cytokine that encourages naive helper T cells (Th0 cells) to differentiate to become Th2 cells. Th2 cells are then activated by IL-4 and produce more IL-4 causing a positive feedback loop as part of the immune response. It has not yet been confirmed which cell type initiates the IL-4 cycle but some research does suggest it could be the basophils, which quercetin is able to modulate (8). Excessive levels of IL-4 are associated with allergies (9). Quercetin is known to influence the recruitment of immune cells to the skin and combating secondary infections should the skin barrier be broken (10). Quercetin is able to exert an anti-inflammatory action by inhibiting enzymes like lipoxygenase and other inflammatory regulators. It influences immunity and the inflammatory response by acting on leukocytes and signalling factors, enzymes and membrane proteins with key functions (11). Quercetin is also shown to affect the production of cytokines such as IL-8 and TNF-a which are involved in the inflammatory response (12-13). This is why quercetin might be suitable for the treatment of allergic inflammatory diseases like asthma, rheumatoid arthritis and sinusitis. Quercetin is an effective inflammatory suppressor for treating allergic asthma and a study investigated the anti-inflammatory effects of both quercetin and isoquercetin (isoquercitrin) in a mouse model of asthma. The research team feed the mice with both flavonoids and observed that eosinophil and white blood cell levels were significantly lower in the bronchoalveolar fluid, blood and lung tissue when compared to the control mice (14). The same team conducted a second study comparing a quercetin enriched microemulsion and a quercetin suspension in a mouse model of allergic inflammation of the airways (15). Oral supplementation of the quercetin suspension failed to influence leukocyte recruitment, however the microemulsion inhibited this recruitment in a dose-dependent manner. The microemulsion was also able to decrease the level of NF-kb and reduced levels of IL-4 and IL-5. Another research study in 2009 investigated if quercetin influenced eosinophil peroxidase activity an enzyme found within the eosinophil granulocytes, the innate immune cells of humans and mammals (16). The research team demonstrated that asthmatic reactions in mice could be significantly reduced by the administration of quercetin. The results of a number of epidemiological studies suggest that increased consumption of flavonoids is beneficial for asthma (17). Further, clinical trials using flavonoids have shown ameliorative effects on asthma symptoms (18). The preventative effect of quercetin supplementation on asthma incidence has also been demonstrated by epidemiological and population-based case-control studies (19). Cases of food allergies are becoming increasingly common globally. Standard recommended treatment is simply avoiding the foods that provoke the allergic reaction. A study showed that quercetin and other flavonoids are capable of mediating the immune reaction in mucosal tissues during allergic reactions (20). Peanut allergies are a very common food allergy and a study explored the effects of quercetin on peanut induced allergic reactions in rats (21). Quercetin were fed quercetin for a total of four weeks which completely prevented peanut based allergic reactions. In comparison the test group showed blood histamine levels that were significantly lower than their control group counterparts. This demonstrates that quercetin is a potent suppressor of the immune response against peanut protein induced allergic reactions and of interest as a therapy. The prevalence of allergic diseases has been increasing in the last few decades with food and respiratory allergies at the top of that list. There is a demand for new ways to combat these conditions and the flavonoid family of compounds has been in the spotlight for that exact reason and in particular quercetin. Quercetin has received a great deal of attention it displays high antioxidant and anti-inflammatory properties as shown in a large number of in vivo and in vitro studies in both murine and human subjects. Quercetins anti-allergenic properties have also been the focus of many studies and its mechanism of action via the inhibition of enzymes and inflammatory regulators. This article has summarized the role of quercetin in relation to allergic diseases including in vivo, in vitro and epidemiological studies, in particular its role in respiratory and food allergies. The results of these studies suggest quercetin could be used in the treatment of allergic disorders and that phytochemicals such as quercetin could be used as an effective cure. (1) Jantan, I., Ahmad, W., & Bukhari, S. N. A. (2015). Plant-derived immunomodulators: an insight on their preclinical evaluation and clinical trials. Frontiers in plant science, 6. (2) Singh, A., Holvoet, S., & Mercenier, A. (2011). Dietary polyphenols in the prevention and treatment of allergic diseases. Clinical & Experimental Allergy, 41(10), 1346-1359. (3) Kimata, M., Shichijo, M., Miura, T., Serizawa, I., Inagaki, N., & Nagai, H. (2000). Effects of luteolin, quercetin and baicalein on immunoglobulin E-mediated mediator release from human cultured mast cells. Clinical and Experimental Allergy, 30(4), 501-508. (4) Marzocchella, L., Fantini, M., Benvenuto, M., Masuelli, L., Tresoldi, I., Modesti, A., & Bei, R. (2011). Dietary flavonoids: molecular mechanisms of action as anti-inflammatory agents. Recent patents on inflammation & allergy drug discovery, 5(3), 200-220. (5) Juríková, T., Mlček, J., Sochor, J., & Hegedűsová, A. (2015). Polyphenols and their Mechanism of Action in Allergic Immune Response. Glob J Allergy 1 (2): 037-039. DOI: 10.17352/2455, 8141, 037. (6) Gröber, U. (2009). Micronutrients: Metabolic tuning-prevention-therapy. Drug Metabolism and Drug Interactions, 24(2-4), 331-331. (7) Nair, M. P., Kandaswami, C., Mahajan, S., Chadha, K. C., Chawda, R., Nair, H., … & Schwartz, S. A. (2002). The flavonoid, quercetin, differentially regulates Th-1 (IFNγ) and Th-2 (IL4) cytokine gene expression by normal peripheral blood mononuclear cells. Biochimica et Biophysica Acta (BBA)-Molecular Cell Research, 1593(1), 29-36. (8) Sokol, C. L., Barton, G. M., Farr, A. G., & Medzhitov, R. (2008). A mechanism for the initiation of allergen-induced T helper type 2 responses. Nature immunology, 9(3), 310-318. (9) Hershey, G. K. K., Friedrich, M. F., Esswein, L. A., Thomas, M. L., & Chatila, T. A. (1997). The association of atopy with a gain-of-function mutation in the α subunit of the interleukin-4 receptor. New England Journal of Medicine, 337(24), 1720-1725. (10) Singh, A., Holvoet, S., & Mercenier, A. (2011). Dietary polyphenols in the prevention and treatment of allergic diseases. Clinical & Experimental Allergy, 41(10), 1346-1359. (11) Chirumbolo, S. (2010). The role of quercetin, flavonols and flavones in modulating inflammatory cell function. Inflammation & Allergy-Drug Targets (Formerly Current Drug Targets-Inflammation & Allergy), 9(4), 263-285. (12) Weng, Z., Zhang, B., Asadi, S., Sismanopoulos, N., Butcher, A., Fu, X., … & Theoharides, T. C. (2012). Quercetin is more effective than cromolyn in blocking human mast cell cytokine release and inhibits contact dermatitis and photosensitivity in humans. PloS one, 7(3), e33805. (13) Kempuraj, D., Madhappan, B., Christodoulou, S., Boucher, W., Cao, J., Papadopoulou, N., … & Theoharides, T. C. (2005). Flavonols inhibit proinflammatory mediator release, intracellular calcium ion levels and protein kinase C theta phosphorylation in human mast cells. British journal of pharmacology, 145(7), 934-944. (14) Rogerio, A. P., Kanashiro, A., Fontanari, C., da Silva, E. V., Lucisano-Valim, Y. M., Soares, E. G., & Faccioli, L. H. (2007). Anti-inflammatory activity of quercetin and isoquercitrin in experimental murine allergic asthma. Inflammation Research, 56(10), 402-408. (15) Rogerio, A. P., Dora, C. L., Andrade, E. L., Chaves, J. S., Silva, L. F., Lemos-Senna, E., & Calixto, J. B. (2010). Anti-inflammatory effect of quercetin-loaded microemulsion in the airways allergic inflammatory model in mice. Pharmacological research, 61(4), 288-297. (16) Park, H. J., Lee, C. M., Jung, I. D., Lee, J. S., Jeong, Y. I., Chang, J. H., … & Shin, Y. K. (2009). Quercetin regulates Th1/Th2 balance in a murine model of asthma. International immunopharmacology, 9(3), 261-267. (17) Fortunato, L. R., Alves, C. D. F., Teixeira, M. M., & Rogerio, A. P. (2012). Quercetin: a flavonoid with the potential to treat asthma. Brazilian Journal of Pharmaceutical Sciences, 48(4), 589-599. (18) Tanaka, T., & Takahashi, R. (2013). 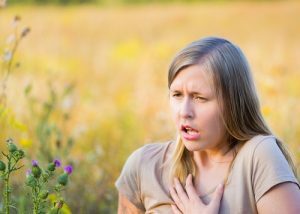 Flavonoids and asthma. Nutrients, 5(6), 2128-2143. (19) Knekt, P., Kumpulainen, J., Järvinen, R., Rissanen, H., Heliövaara, M., Reunanen, A., … & Aromaa, A. (2002). Flavonoid intake and risk of chronic diseases. The American journal of clinical nutrition, 76(3), 560-568. (20) Wei, J., Bhatt, S., Chang, L. M., Sampson, H. A., & Masilamani, M. (2012). Isoflavones, genistein and daidzein, regulate mucosal immune response by suppressing dendritic cell function. PLoS One, 7(10), e47979. (21) Shishehbor, F., Behroo, L., Broujerdnia, M. G., Namjoyan, F., & Latifi, S. M. (2010). Quercetin effectively quells peanut-induced anaphylactic reactions in the peanut sensitized rats. Iranian Journal of Allergy, Asthma and Immunology, 9(1), 27.